Goodreads says, "Every family has its problems. But even among the most troubled, the Plumb family stands out as spectacularly dysfunctional. Years of simmering tensions finally reach a breaking point on an unseasonably cold afternoon in New York City as Melody, Beatrice, and Jack Plumb gather to confront their charismatic and reckless older brother, Leo, freshly released from rehab. Months earlier, an inebriated Leo got behind the wheel of a car with a nineteen-year-old waitress as his passenger. The ensuing accident has endangered the Plumbs joint trust fund, “The Nest,” which they are months away from finally receiving. Meant by their deceased father to be a modest mid-life supplement, the Plumb siblings have watched The Nest’s value soar along with the stock market and have been counting on the money to solve a number of self-inflicted problems. Melody, a wife and mother in an upscale suburb, has an unwieldy mortgage and looming college tuition for her twin teenage daughters. Jack, an antiques dealer, has secretly borrowed against the beach cottage he shares with his husband, Walker, to keep his store open. And Bea, a once-promising short-story writer, just can’t seem to finish her overdue novel. Can Leo rescue his siblings and, by extension, the people they love? Or will everyone need to reimagine the future they’ve envisioned? Brought together as never before, Leo, Melody, Jack, and Beatrice must grapple with old resentments, present-day truths, and the significant emotional and financial toll of the accident, as well as finally acknowledge the choices they have made in their own lives. This is a story about the power of family, the possibilities of friendship, the ways we depend upon one another and the ways we let one another down. In this tender, entertaining, and deftly written debut, Sweeney brings a remarkable cast of characters to life to illuminate what money does to relationships, what happens to our ambitions over the course of time, and the fraught yet unbreakable ties we share with those we love." The Plumb family has left their children a hefty inheritance, except that they cannot access it until the youngest child turns forty. The Plumb children knew their whole lives that their inheritance or "The Nest" was coming, so they didn't fret too much over college tuition or large bills. However, everything changes when the eldest child, Leo, leaves a wedding early with one of the waitresses and crashes his car. The waitress loses her foot in the accident; plus, Leo was high and drunk. In order to pay for all the hospital bills and pay the waitress, their mother has allowed Leo to access "the nest" early. In fact, he has burned through almost all of it! When the other siblings find out, they decide to call a meeting to discuss how Leo is going to pay them back. He will, right? Just out of rehab, Leo shows up to the meeting and makes many empty promises, which the other siblings fall for. 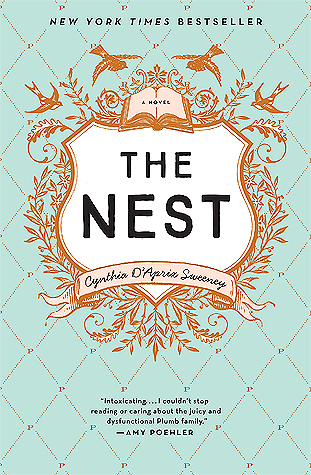 Cynthia D'Aprix Sweeney's debut, The Nest, is an enertaining novel that examines relationships and has tons of family drama. In The Nest, the point of view switches quite often from the various Plumb siblings as well as other minor characters. First, there's Leo, the charismastic, but troubled eldest son. He just can't seem to get it together. Then there's Bea, an aspiring writer, and Jack, who everyone refers to as Leo Lite. Jack was always in the shadow of his big brother. Lastly, there's Melody, the youngest Plumb sibling, who is a heliicopter parent to two teenage girls. All four Plumb siblings have issues and many of them have financial issues, which is why when they find out that "the nest" has been depleted, it's a huge blow. Jack has found himself in a financial bind and Melody may even lose her house in the suburbs. Things are starting to look dire. Will Leo rise to the occasion? While I liked hearing from the various point of view in The Nest and getting to know each Plumb sibling, I felt that the other points of view from minor characters weren't always necessary and messed with the flow of the novel from time to time. I wanted the focus to be on the four Plumb siblings a bit more, so that was my one gripe with the novel. 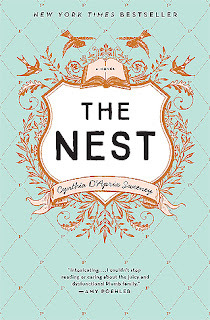 Nonetheless, if you like books filled to the brim with family drama and secrets, you should definitely check out The Nest this spring to see what is in store for the Plumb family. Sounds kind of interesting! Too bad about the use of too many points of view. That can really affect the pacing and even character development. I had that issue with the new Mary Kay Andrews novel. In that one people have money struggles too and find out that an investment deal went south. Yeah, that was my only issue with the novel. Thanks for the heads up about Andrews latest novel and the multiple POVs. Hoping to read that one soon. Thanks for visiting, Christina! I hope you enjoy it, Joy! Can't wait to hear your thoughts. Thanks for visiting. Normally more than 2 POVs is a bit of a struggle for me, but I think in this context I would be fine with the 4 siblings. It's a shame some secondary characters jump in there and disrupt the flow a touch. Still, I'm glad you enjoyed this one overall Christina! Yeah, it's the secondary characters that sort of mess up the pace for me. Overall, it was still a great read though. Thanks for visiting, Jenny! Loving the cover but multiple POV can sometimes boggle my mind mid read if not distinctive. Still... sounds interesting. Thanks for the share! Yes, I definitely struggle with that as well. If you can get past that though, it's a fun read. Thanks for visiting, Gina! It was definitely a little tough to keep up at times but, overall, I really enjoyed this one! I think it's a pretty good summer read! Me too, Tara. It would be perfect as a vacation read. I'm glad you enjoyed it as well. Thanks for visiting!